Here we have an example of one of our basic chord diagrams. The horizontal lines show the strings while the vertical lines shows the frets. The furthest fret on the right is always the first fret on your ukulele. 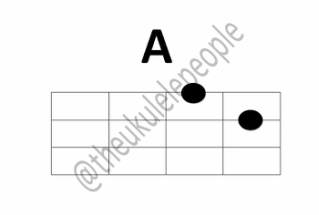 Sometimes, there could be five frets on the diagram but the furthest fret on the right will always be the first fret on your ukulele. Below, we have an example of a five fretted chord diagram. The horizontal lines on the diagram show the strings G, C, E and A from top down. The example on the left shows that you must put one finger on the G string on the second fret and another finger on the C string on the first fret.